One of the original “precious gemstones,” opals have been celebrated and coveted through the ages. Of the enigmatic gem, Pliny the Elder described, “a play within them that they equal the deepest and richest colors of painters. Others… simulate the flaming fire of burning sulfur and even the bright blaze of burning oil.” The light phenomenon he so poetically described is what modern geologists call “play of light”. This visually exciting effect is caused by light bouncing off silica spheres inside the structure of the gem. They can include all colors in the visible spectrum. A good example of an play of color exhibiting the full spectrum is shown above in Adam’s ring Northern Lights. 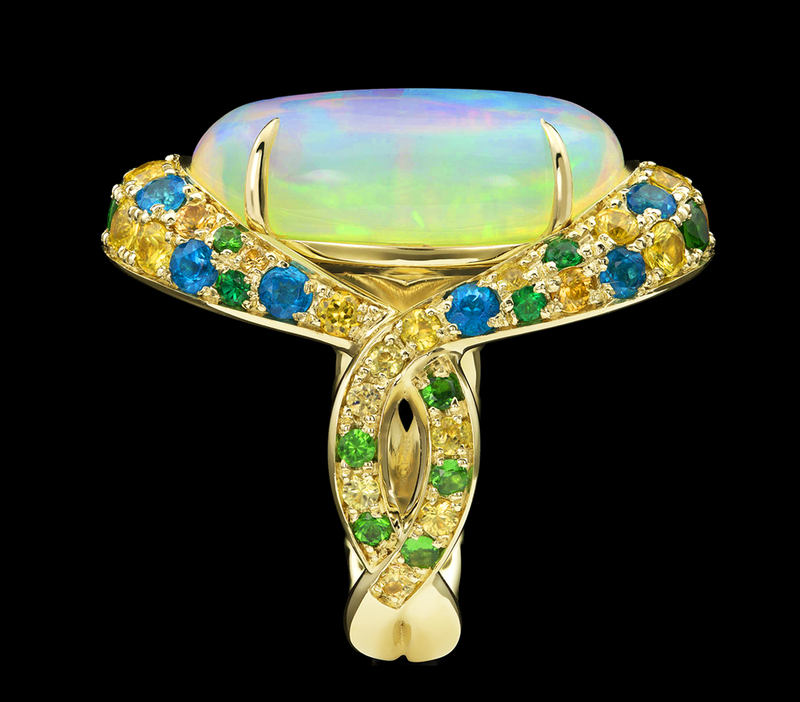 About 95% of precious opals are found in Australia. The color of an opal might be clear, white, gray, or even black which is the most valuable variety. 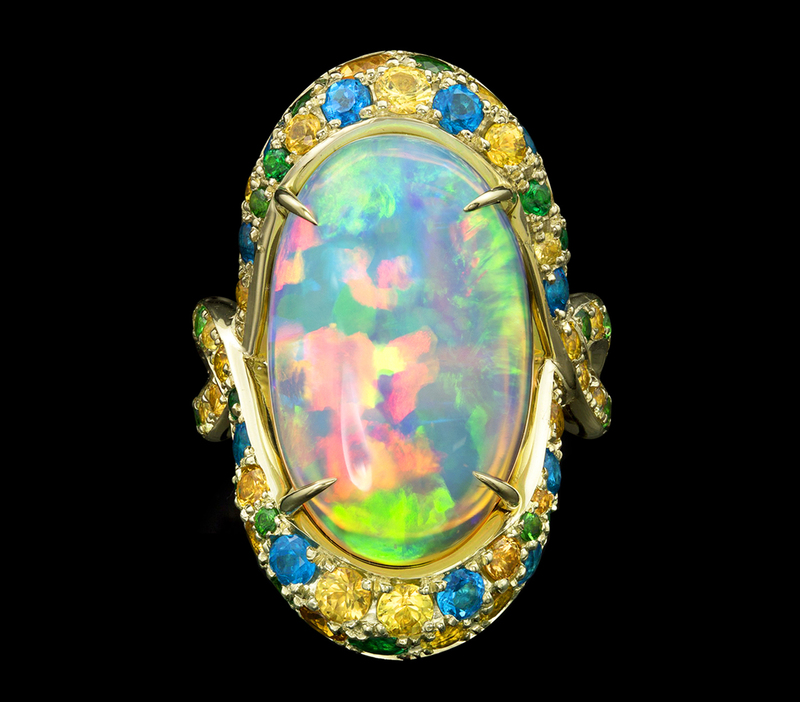 Fire and Ice Opal Ring, right, features a black opal with blue, green, and violet play of color. 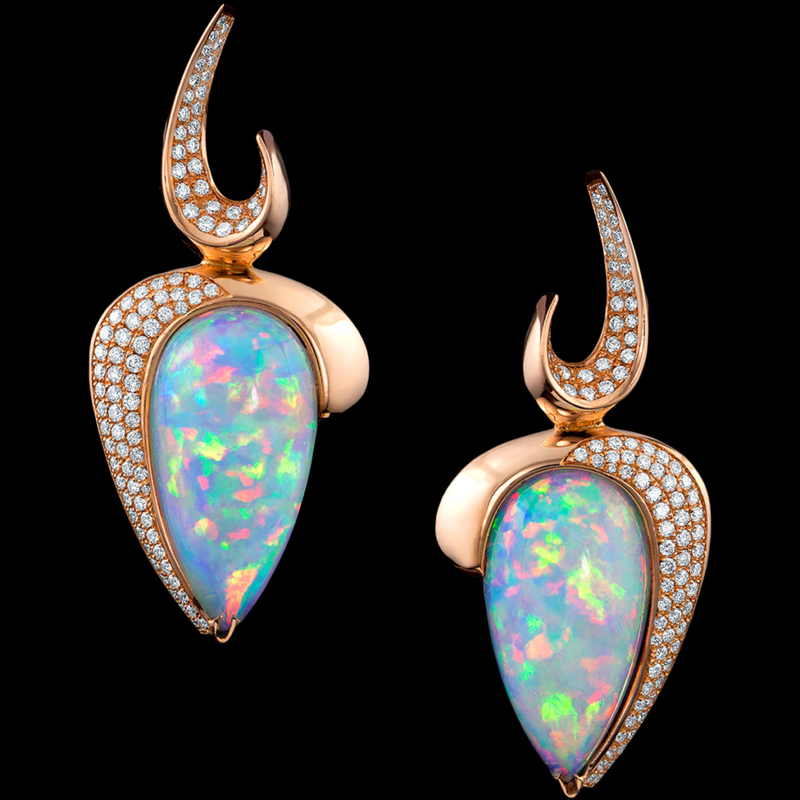 “Through the design, I wanted the pavé diamonds to appear as if they had melted from the fire and beauty of this opal,” Neeley describes. Scientists have found opal on a meteorite originating from Mars, a fact celebrated by more than just gem-enthusiasts. The geological conditions for the formation of this type of opal are near hot springs. Scientists hope that examining the water content of Martian opals, like a time capsule, could give them some glimpse into past microbial life. The Opal is the birthstone for October. Superstition about opal-wearing by those born in other months was the unintended consequence of 1820s novel, Anne of Geierstein by Sir Walter Scott. In fact, for most of history, it have been considered one of the luckiest gems. Like the rainbow, which contains all of the colors of the spectrum, these gems have been thought to bestow good fortune. In the Middle Ages, it was believed that wearing one could protect blond hair from fading and add luster. Protection, enhanced eyesight, foresight, and even invisibility have also been attributed to this storied stone. Opals are tougher than many people think, but it’s a good idea to give your opal the day off if you’re working with harsh chemicals like chlorine or bleach. 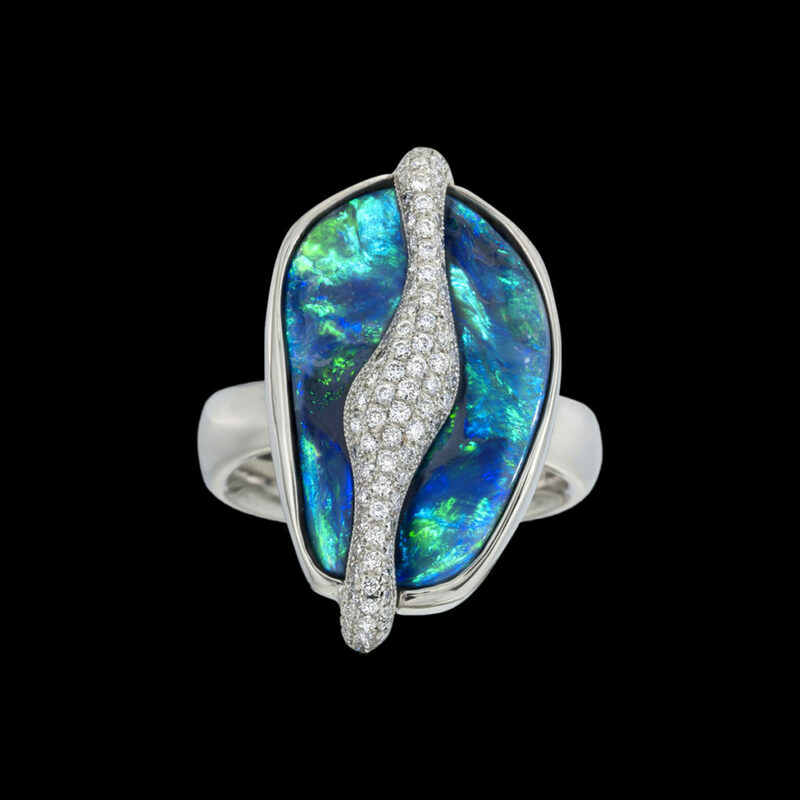 Intense heat or dramatic temperature changes are not appropriate for opals; it can cause fracture lines called “crazing”. GIA lists more information and cleaning tips for solid opals. If you’re unsure, just ask you jeweler about best care to keep your opal radiant. Contact us about Adam’s jewelry or custom work featuring opals. 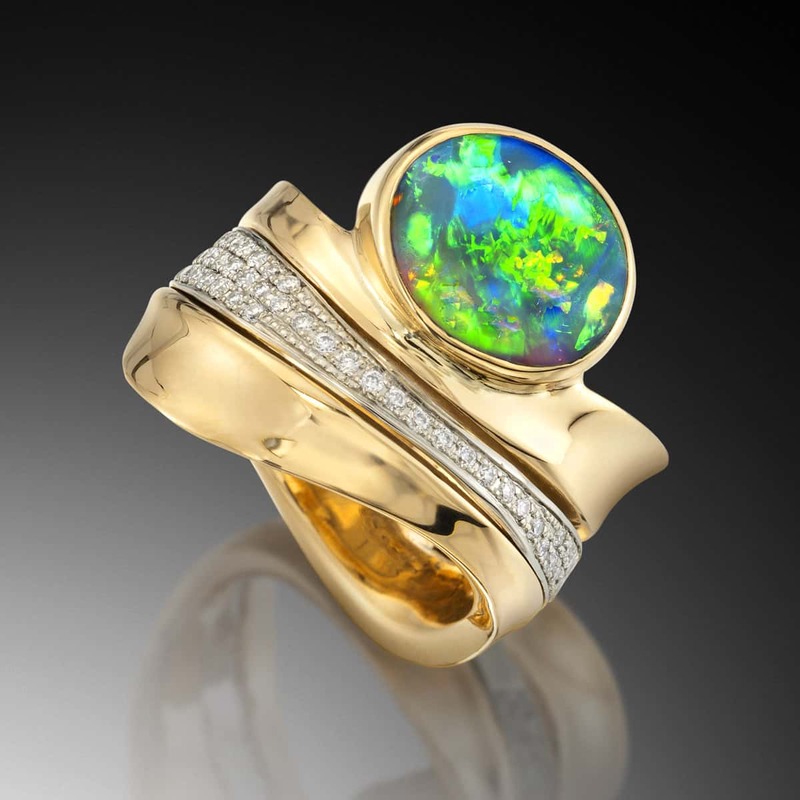 “Australian Opals and Opal Jewellery.” Accessed October 11, 2016. https://www.opalsdownunder.com.au/. “Opal Care and Cleaning Guide.” Accessed October 11, 2016. http://www.gia.edu/opal-care-cleaning. “Opal Discovery on Mars May Be Key to Proving Ancient Life on Red Planet — RT News.” Accessed October 11, 2016. https://www.rt.com/news/272482-opal-mars-ancient-life/.